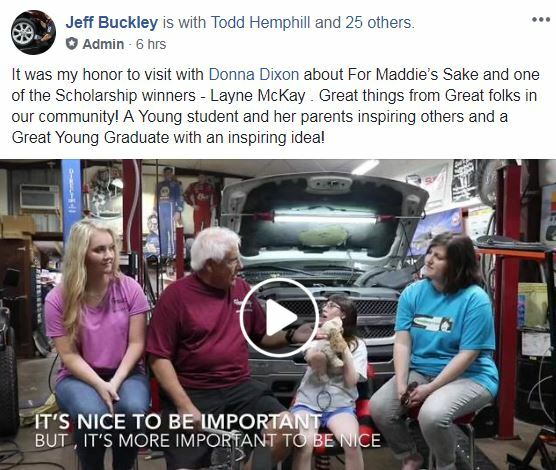 Scholarship - FOR MADDIE'S SAKE, INC. For Maddie's Sake! The 2019 scholarship winners have been chosen and will be awarded in June. Our scholarships are awarded annually to a deserving Midlothian ISD graduate who plans to pursue a career in healthcare or special education so they can return to the community to serve people. Since 2016 we have awarded $5,000 to four Midlothian ISD graduates. We accept donations from anyone who wants to support our cause and hope to continue to grow our funds so we may award more money. Thank you in advance for supporting our cause. ​CRITERIA—A Midlothian, Texas ISD high school graduate from 2017, 2018 or 2019 planning to study special education healthcare or teaching in an accredited program. DEADLINE—Submit application online no later than March 15.